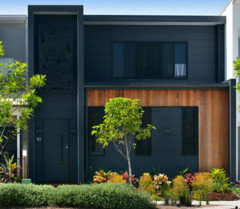 I have engaged an architect to design the renovation to my dream home in the Sutherland Shire, NSW. I would welcome any tips, comments or suggestions to improve the facade, design, layout or finishes schedule of the property. Amazing looking house with a stunning position, I do wonder about the two car garage. And find it strange that in a family sized home that the bath is in the ensuite and it's the only one? The ensuite to the master could do with being a little wider at the expense of the WIR. Assuming the width is 1800/1900 (door of 820? shower of 1000?) the vanity space is going to come out of the walkway space. Even if it is 2000 wide there is not enough space between the vanity and the shower to walk through. It will look cramped and in the real world won't work. You could add up to 300mm in the width without much fuss to the WIR and it will make a large difference to the ensuite. Also, the study walk way is only 1m. It means if you use any chair other than something that completely pushes in you have another restriction. Again, an extra 2-300mm in this area wouldn't kill the bedroom (although the corner becomes narrower if you don't offset the bed) or make the desk shallower. And finally, we often suggest to our clients to move the sink off the wall and into the island so that you are looking at your guests/view whilst you are prepping or cleaning up meals. It's not everyone's preference but we have found it surprisingly not considered. gosh I'd find all that roof at the facade very oppressive but guess you must like it. my husband says he would be happy to live in that car and admire the view! My first concern is the overpowering roof. It's huge and dominates the rest of the home. I also think that the new entry structure fights with the roof for attention. I appreciate that this is an existing home and we have to work with what's there but the street presentation isn't good and looks confused. You are obviously very committed to this and it appears that you are going to need a significant budget to achieve what is intended. If it were me I'd seriously investigate replacing the roof with a new low pitch roof or flat roof behind parapets. This will be the single most effective thing you can do and will add value to the home. Have your architect draw up some options to assess the effectiveness of their ideas. Try adding structure such as a frame to work with and visually reinforce the entry structure. It doesn't have to cost the earth as a roof can be replaced without loosing the ceilings and causing damage that needs rectification. A low pitch roof will also offer the chance to open up the upper floor with large windows and balconies. 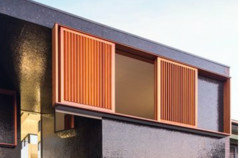 Yes, a balcony off the ensuite could add drama to the ensuite and help create an interesting street elevation with large sliding timber batten privacy screens. Consider cantilevering the ensuite floor to extend the ensuite out towards the side boundary. You appear to have the room and it will remove the bland boxiness of the old home while providing a larger better ensuite with views to the water while sitting in your new spa bath. Can't go wrong with that. Generally it needs a fresh approach free from the shackles of the existing architecture. You are going to get a lot of ideas flow to you on this one. Some will be good, some will be bad and you will get confused at times so work with your architect and rationalise the ideas. 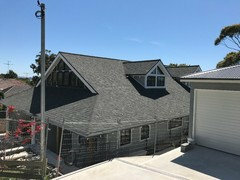 Above all, rethink the street elevation, because that is what everybody will judge this renovation by and saving money on that will cost you money in the end. I have had a quick trawl through Houzz photo gallery and picked 3 designs that demonstrate some of the elements I have mentioned to help clarify my suggestions. Neither design is an answer, that's for you and your architect to decide but addition of these elements could take your "dream Home" to the next level. The large sliding privacy screens is an obvious one. The next one shows a home with the interplay of light and dark colours, privacy screens within a frame structure and the use of balcony space which acts as a transition from public to private space. The creation of large roof overhangs or frames and balcony spaces also gives the home depth with shadows and adds interest. 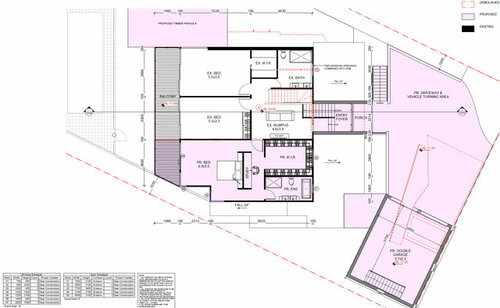 The third design demonstrates how an entry similar to what you have planned is complimented with thin low pitch roof, allowing the entry to integrate with the rest of the home. The building and surrounding hard surfaces look as if they'd absorb a great deal of heat. Preferred garage dinpmension is 6x6 as this allows you to walk all around any car and full door opening. If you want to turn the vehicle in the turning area get a traffic expert to check the tuning circle. They can also show where the hard paving could be removed for landscaping to improve kerb appeal and reduce heat effect and drainage. Kids bath if possible separate a powder room from shower room although I note it is an existing bathroom. 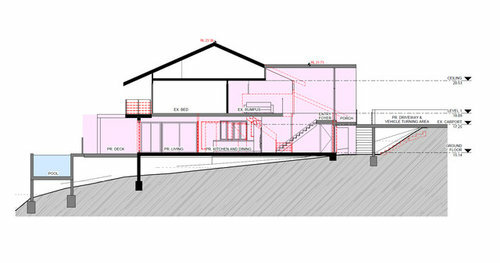 Are you raising existing house to build under and extending? Replace all the corrugated metal roof on the entry side for a garden or grass roof. This will enhance your approach and front facade and transform it from an overpowering amount of meal roof to something soft, natural and rather special. 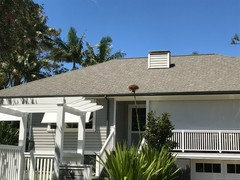 American Shingle roofing would soften this facade but keep the contemporary look. Here are photos of two recent projects, many colours and profiles to choose from. Have you considered giving yourself access to your laundry through the WIP/Butlers kitchen? Might get pretty annoying going out in the cold to do your laundry. And with 2 storey houses a laundry chute is always very handy. Love the house!!! Which room is mine? What a great project! I love the design. 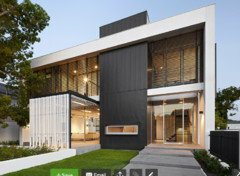 Lots of good ideas on Houzz. 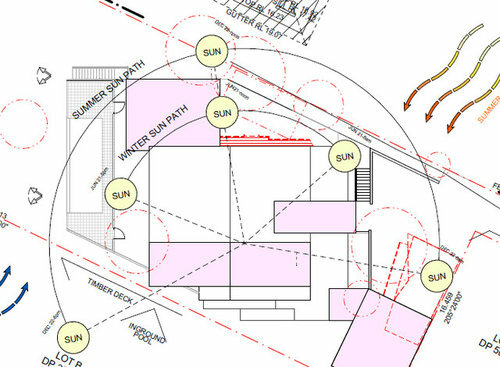 One further thought bubble I had looking at the floorplans is - is there an opportunity to get more of that north facing light in - appreciate the views are to the east with massive glass walls which is great - but seem a pity to have so much blank wall facing north. Good luck with the project - would love to see progress reports!! Like others here, at first glance I assumed the view of the water was to the east, but then realised from the sun diagram that north is up the page, so I'm guessing this might be in Bundeena? - door to laundry from pantry instead of bath room. Before making any real comments on this renovation, i have 4 questions . 1. Is it possible to have a picture of current front of house. 3. Are as the architect has shown summer winds from the east, making the axis of house north west. 4. Are you happy with position of master bed on western side of house. Getting hot in summer from afternoon sun. 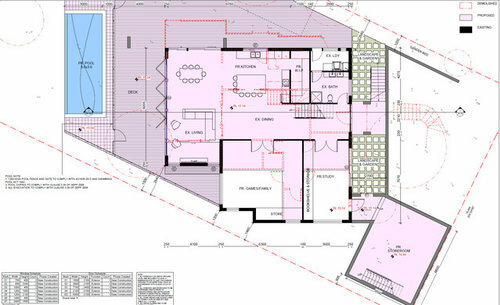 P.s i think oklouise lower floor plan is a more practical layout. Just a quick idea, for facade. You could than maybe use space between bathrooms an new outer facade as covered private area's . Looking to renovate? The tricks and truths to renovating your home. Can my dream of having a walk-in wardrobe become reality?